Now that I've had a chance to do the laundry and say goodbye to jetlag, I'm going to post a few more details about the trip, much of it in response to questions I've had (and mostly so I won't forget). Although we had internet access on the boat it was not completely reliable and I was generally too exhausted from the day's ride to get into too much detail in my blog posts during the trip. The company I booked my trip with was not the actual company that manages the boats. The company is an Italian company Giro Libero. They run quite a few bike trips and another bike/barge from Venice to Mantova. The crew was mostly Italian, so I didn't get much chance on the boat to practice my French! The boat is a converted barge which was upgraded about 5 years ago. The name of our boat was Soleo and for this trip it housed 18 clients and our 2 guides. The rooms are below, each with ensuite and portholes. 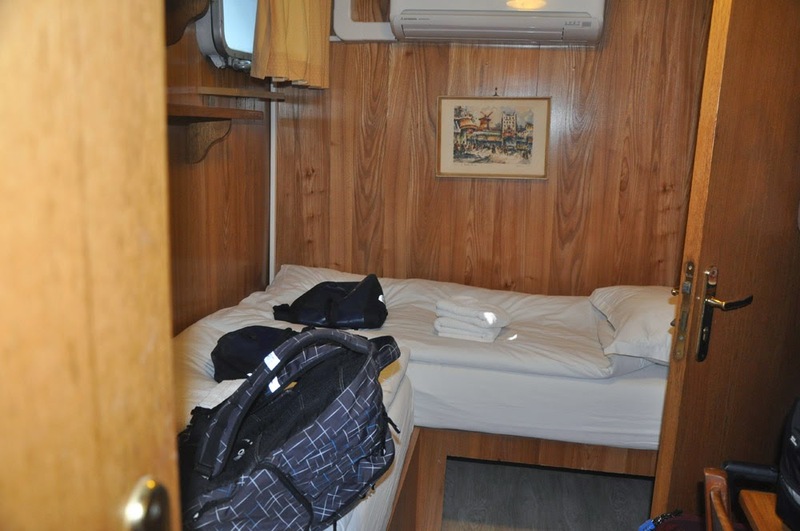 Though small, the rooms are very efficient - kind of like motor home living. The beds are in an L-shape. There are plenty of shelves to store stuff, a closet (which we didn't really use), some drawers under one of the beds and a space under the other bed to store our suitcases. Even Marj's large one fit under. As you might expect the bathroom is quite small but the shower had plenty of hot water and good pressure. 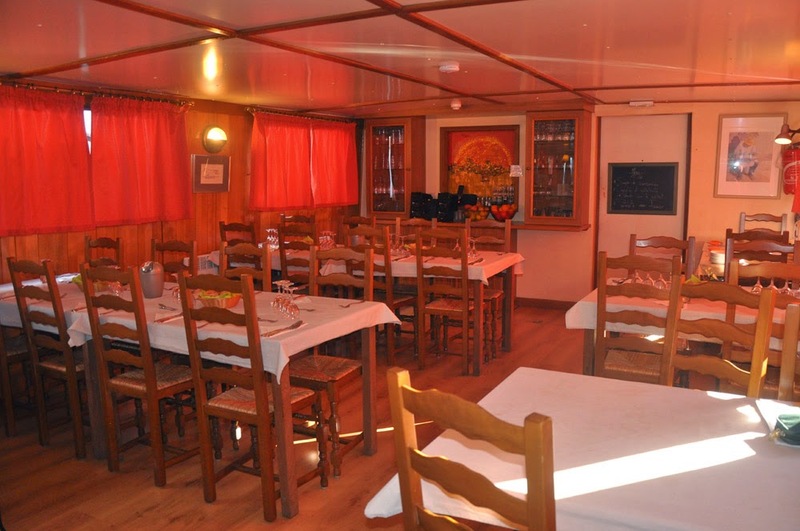 On the main deck is the kitchen, dining room, bar/lounge, deck, bike storage area. 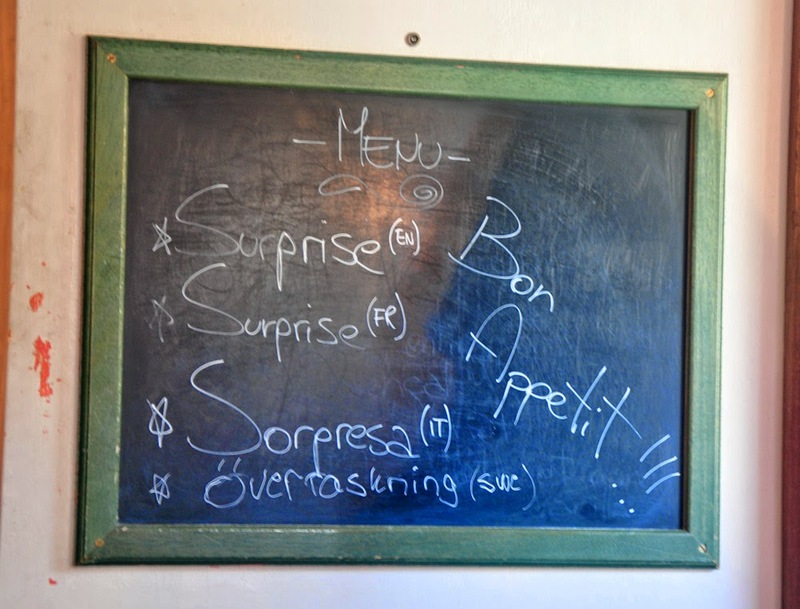 This is the dining area - on the door into the kitchen is a blackboard where the chef, Paulo, would write the evening's menu. On the last day, however, he had a surprise for us, in the 4 different languages spoken on the boat (French, English, Italian and Swedish). I can't remember the whole meal, but I won't forget the tiramisu we had for dessert! The bikes were a better quality than I'd expected - perhaps even better than mine at home - 21/24 gears, with high-quality pannier. We were given detailed maps and written directions in case we wanted to self-guide. Neither Marj nor I felt comfortable trying to figure out all the little turns, roads, paths, etc. so stayed with the group (most did). 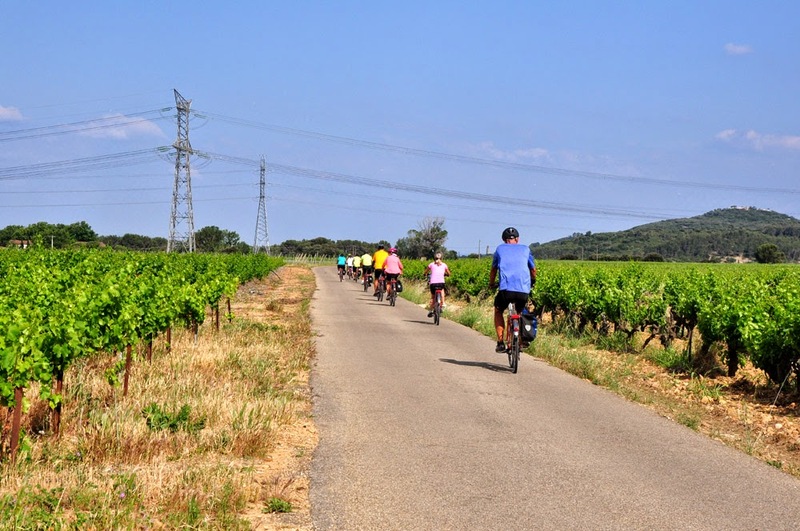 We did a bit of traveling on high traffic roads but it was mostly smaller roads and some dedicated bike paths. At one point we were on a unpaved section where we were required to walk our bikes for a few hundred meters. The trickiest parts were in the villages, navigating through the main streets jockeying with traffic. 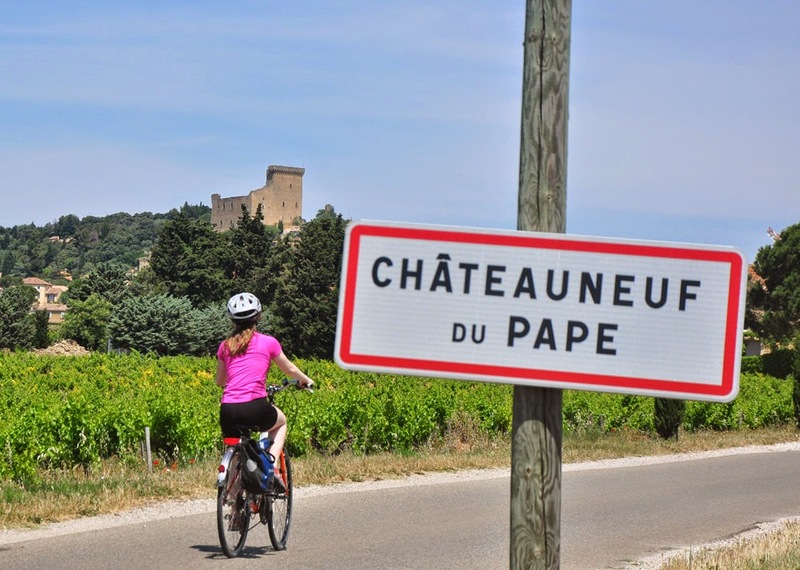 But most often we were biking through vineyards, olive groves, cherry orchards, flamingo ponds, roads lined with oleanders, poppies and rhododendrons, under vast blue skies and looking forward to the next village's patisserie and pain au chocolat. 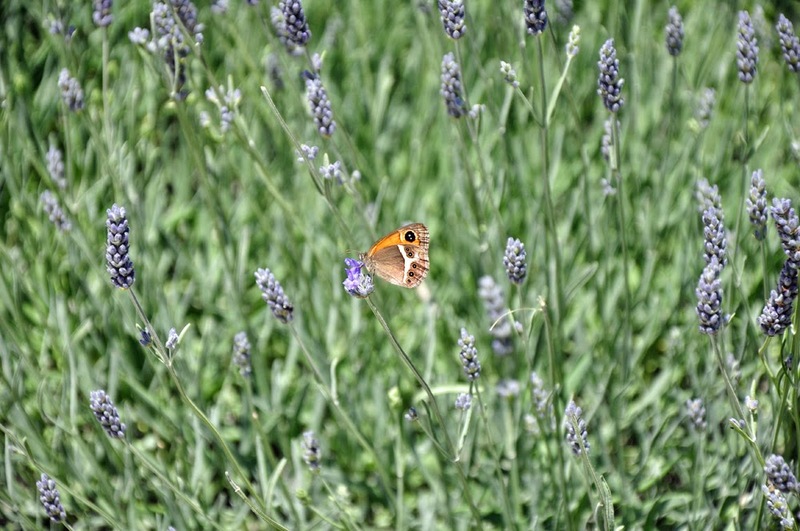 Butterfly among the lavender. We didn't see much lavender in bloom - this was at the chateau at Les Baux - although it is certainly in evidence in the tourist shops - on linens, soaps, calendars, etc. 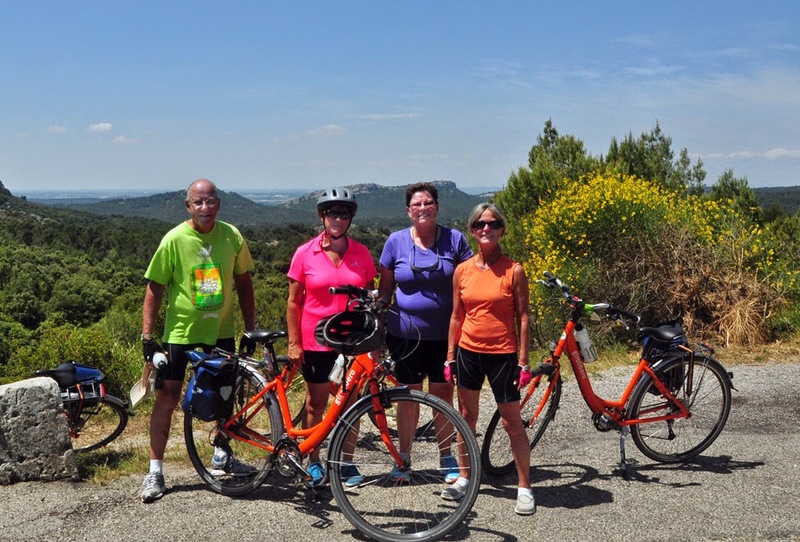 The hill up to Les Baux was probably the toughest of the trip - here the 4 Canadians pose for a shot before continuing the rest of the way up to the town. Ed and Linda (former teachers) are from West Vancouver. 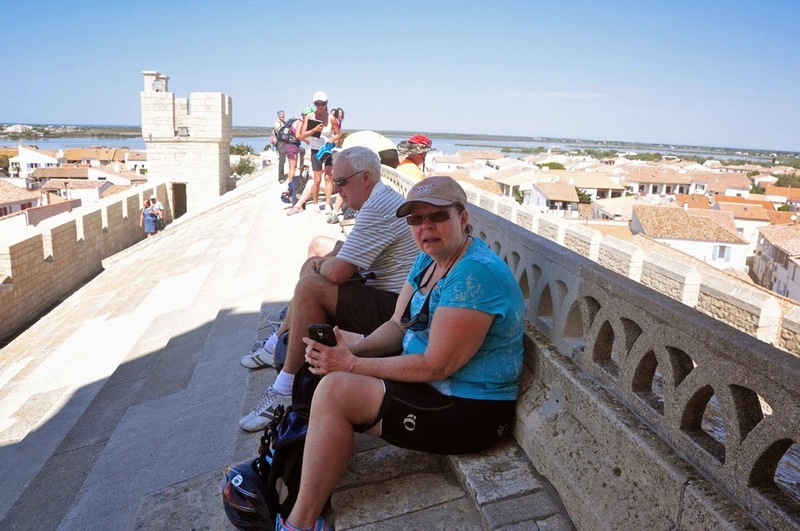 In the village of Saintes-Maries-de-la-Mer we climbed the narrow circling stairs up to the roof of a church where we ate our lunch and had a great view of the Mediterranean. Of course we later dipped our toes in it. 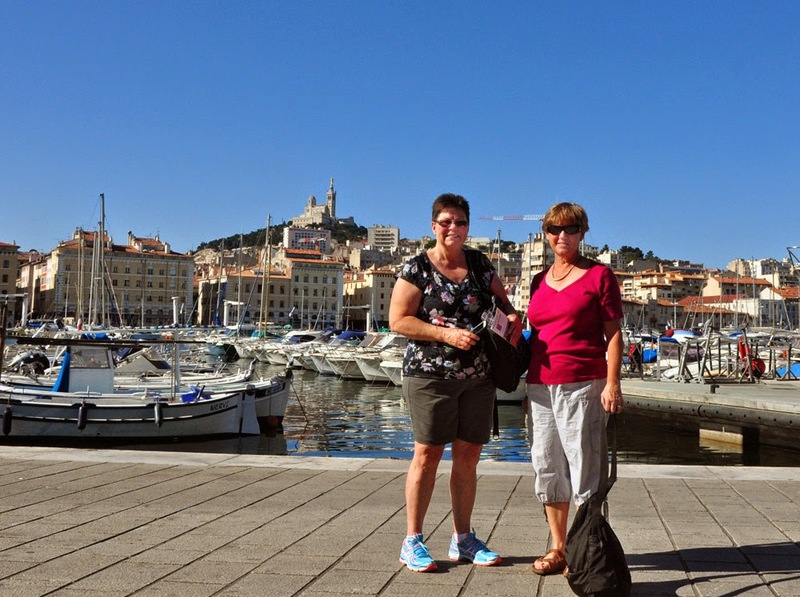 This was our second morning in Marseilles along the old port. 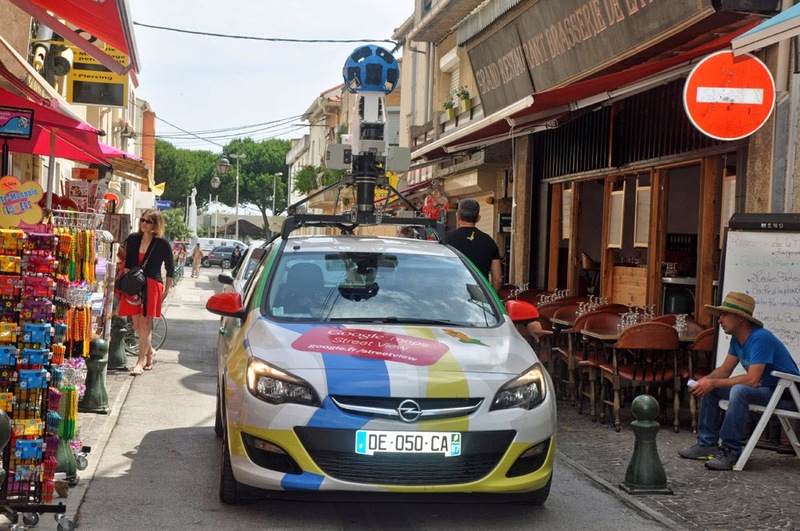 Google street view car in Le Grau-du-Roi - a very touristy town. Maybe you'll see us on the Google. Getting ready for a group photo just before the hill up to Chateauneuf du Pape. 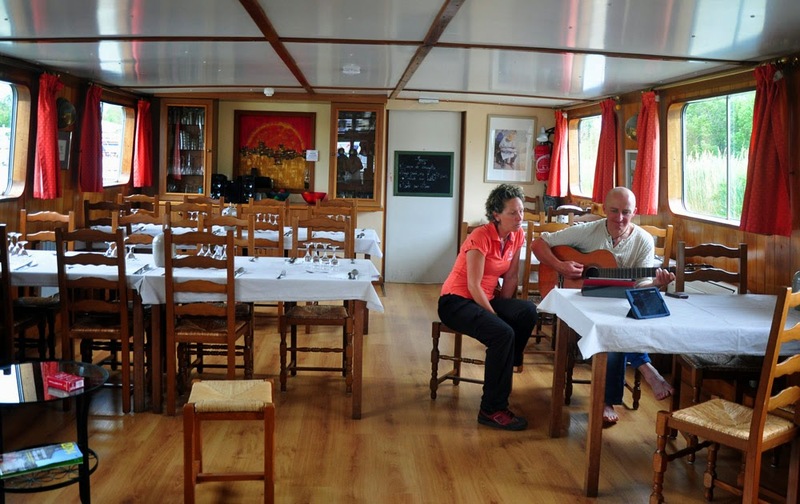 Our guides Tamy and Bert liked to entertain us by strumming and singing.